The Instructional Guide for The ArcGIS Book, a companion to The ArcGIS Book: 10 Big Ideas about Applying Geography to Your World, provides relatable activities and lessons to learn ArcGIS that correspond to each chapter of The ArcGIS Book. The ArcGIS Book, which came out in print and online in 2015, helps GIS students and seasoned pros hone their GIS skills while building and publishing web map apps; using live data feeds in apps; creating and sharing Esri Story Maps apps; making 3D map presentations; and answering complex questions using web maps analysis tools. Some lessons require no software, while others use ArcGIS Online or cloud-based GIS apps such as Esri's Survey123 for ArcGIS, Explorer for ArcGIS, and Collector for ArcGIS. Written by GIS instructors Kathryn Keranen and Lyn Malone, the Instructional Guide for The ArcGIS Book can benefit self-learners or those teaching GIS in a classroom. The guide provides materials to explore and apply GIS concepts and Esri ArcGIS tools to real-world problems. 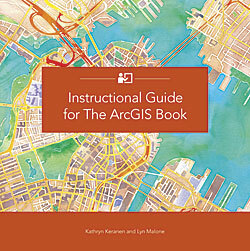 Instructional Guide for The ArcGIS Book is available in print (ISBN: 9781589484702) or as an e-book (ISBN: 9781589484719). The book is available at online retailers worldwide, at esri.com/esripress, or by calling 1-800-447-9778. Outside the United States, visit esri.com/esripressorders for complete ordering options, or visit esri.com/distributors to contact your local Esri distributor. Interested retailers can contact Esri Press book distributor Ingram Publisher Services.